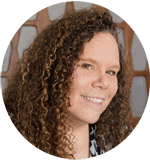 June 25, 2017 By This post may contain affiliate links. 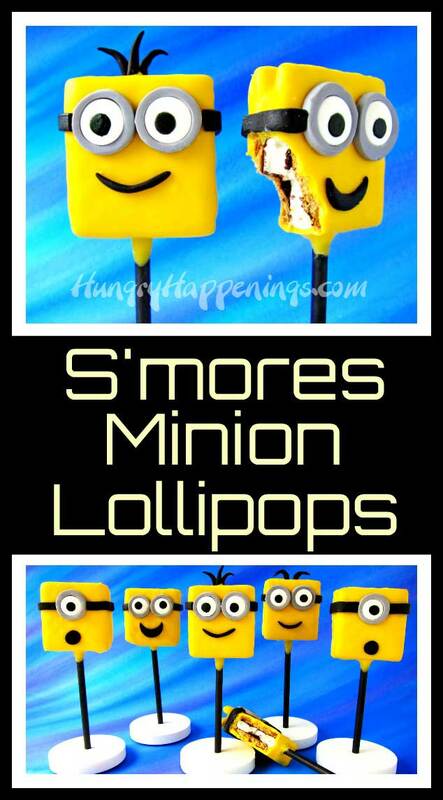 Turn popular summertime treats into adorable S’mores Minion Lollipops. 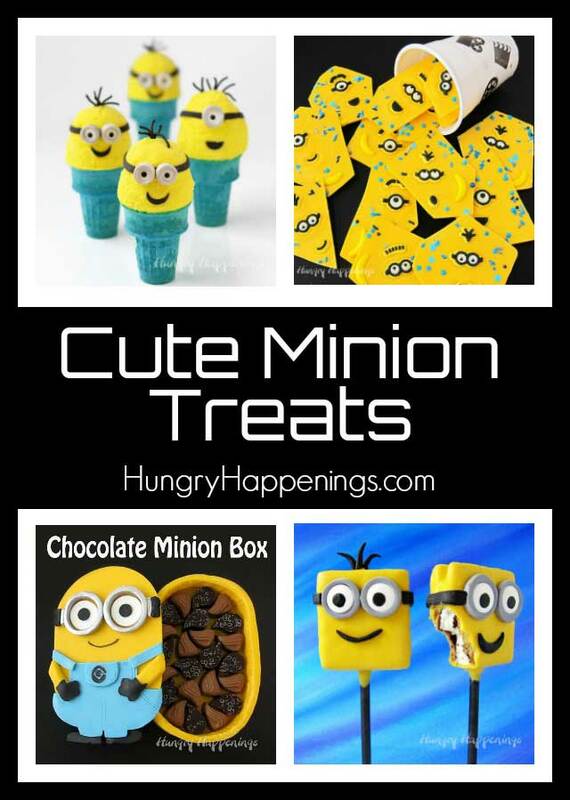 They will be fun snacks or favors for your Despicable Me Minion party. Are you or your kids excited to see the new Despicable Me 3 movie? I am! I’m not sure I’ll be in the theater the first weekend the movie opens, as I prefer a bit quieter theater experience, but I can’t wait to see what Gru and the Minions have in store for us this time and I’ll definitely get to a showing soon. 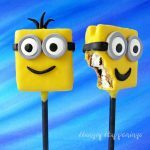 I know a lot of you will be hosting Minion parties or Despicable Me parties being your kids will once again be super excited about the lovable characters from the film, so I wanted to create some adorably cute Minion treats. These s’mores lollipops can be served for dessert alongside a Minion cake or Minion cupcakes or be given to the party guests as a take home party favor. They can be made well in advance of your party so you don’t have to stress out the day of the big event. RELATED: See how to make a Chocolate Minion Box, here. I was inspired to create these yellow candy coated Minion s’mores after seeing something similar at Universal Studios earlier this year. I turned my Minion snacks into lollipops and used candy clay (modeling chocolate) to make the Minion’s goggles, smiles, and hair. Making the decorations using candy clay was a lot neater looking that simply piping on chocolate decorations like they do for the Minion S’mores at the park, and they still taste great. If you’ve not ever used Candy Clay, you’ve got to give it a try. It looks like fondant but tastes like chocolate. 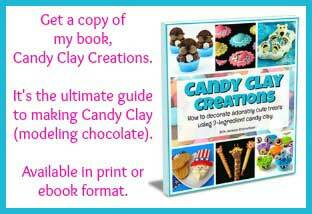 I wrote a book all about it called Candy Clay Creations. I show you how to turn 2 simple ingredients into an easy-to-shape modeling chocolate that can be used to decorate cakes, cookies, cupcakes, and just about any other sweet treat. If you are interested in learning more about making candy clay and decorating adorably cute treats using candy clay, be sure to check out Candy Clay Creations. It’s available in print or ebook format. Watch the video tutorial below to see how you can make these S’mores Minion Lollipops at home. You can find items needed to make these S’mores Minion Lollipops on Amazon.com (commission earned for sales). Cute candy coated s'mores snacks decorated to look like Despicable Me Minions. *You will need a large amount of candy melts in order to dip all 6 of the square s'mores but you will have quite a lot left over for another use. You could make some Minion Chocolate Bark. Cut 6 of the StackerMallows in half lengthwise. Brush a very thin layer of the melted semi-sweet chocolate over the inside of a graham cracker. Arrange one whole StackerMallow and two halves on top of the wet chocolate. Brush a thin layer of chocolate on another graham cracker square and set it on top of the marshmallows creating a sandwich. Repeat creating a total of 6 s'mores sandwiches. Pop in the freezer for 5 minutes. Dip one end of a paper straw or lollipop stick into melted yellow Candy Melts. Insert that tip into the marshmallow center of a s'mores sandwich so that the straw goes up about 3/4 of the way through the sandwich. Repeat, adding straws to all the s'mores, then allow the candy coating to dry for a few minutes. Dip each of the s'mores into yellow candy melts, allowing the excess candy coating to drip off before setting them on a parchment paper lined baking sheet. Meanwhile, roll out the silver colored candy clay to about 1/8 inch thickness. Cut out 1 inch circles (1 or 2 per Minion depending on how many eyes you want to add). Cut a 3/4 inch circle out of each of those 1 inch circles to create the goggles. Insert a jumbo candy eye in the center of each (or make 3/4 inch round candy clay eyes to insert). Roll out the black candy clay and cut into 1/4 inch wide by 2 inch long strips. Create smiles and hair using black candy clay. Use yellow candy melts to attach one or two goggles (eyes) to each s'mores pop. Attach two black strips on either side of the goggles then add smiles and hair to some. Being the s’mores are quite large you will need to have a lot of yellow candy melts in your bowl. 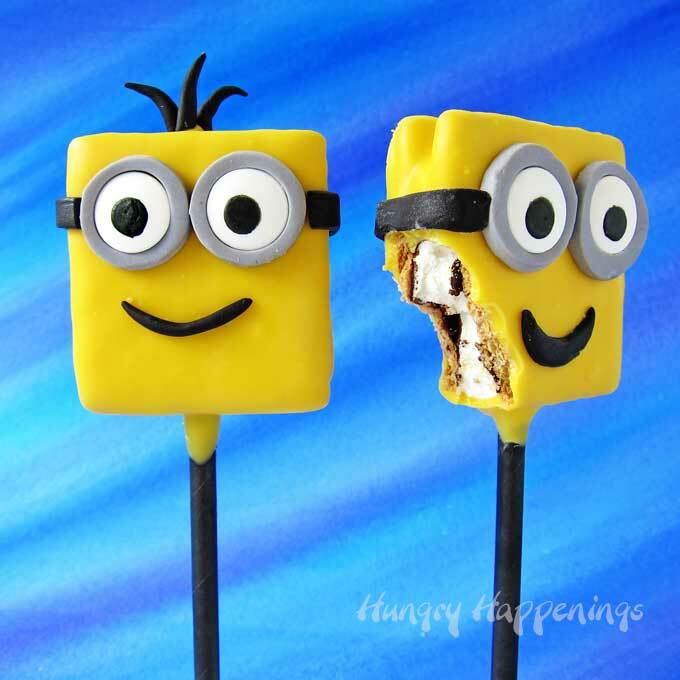 You will have more than half of the candy melts left over when these s’mores Minion Pops are all dipped. You can use the remaining yellow Candy Melts to make some Minion Bark or a Chocolate Minion Box. When you are spreading the semi-sweet chocolate over the graham crackers, try to keep it about 1/4 – 1/2 inch from the edge. You don’t want to add too much or it will melt and bleed into the yellow candy melts when you dip the s’mores. Use jumbo candy eyes or make your own eyes using candy clay. 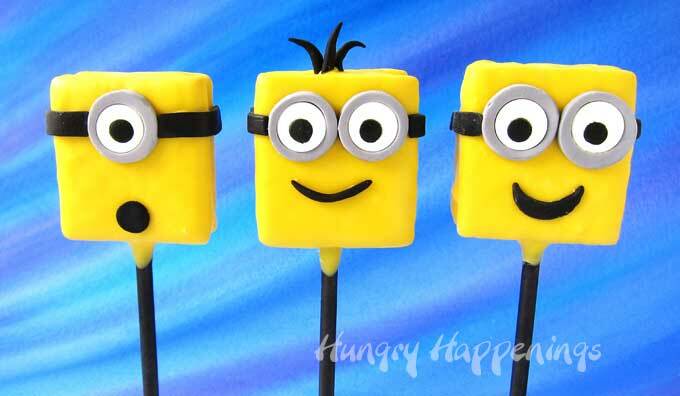 If you are throwing a Despicable Me Minion Party you might also like these other Minion themed fun food crafts. I love making fun food for parties and special occasions and sharing my creative ideas with you. If you make this recipe and share it online be sure to link back to this post and use #hungryhappenings. ahh these are everything undespicable Beth! sure to make villan happy 😁! I have got to watch this movie and make some treats, completely adorable! Although so cute, I don’t know if I could take a bite! I know it is always hard to take the first bite of a totally cute treat! I love your s’mores Minions! I’m just gonna go ahead and use the first word that popped in my head-Beautiful! And I like to see movies at a quieter time as well..I don’t like sitting side-by-side with complete strangers! We went to see the movie early one Sunday morning. The theater was really quiet which I loved! It was a really fun movie.